It is a tradition that every year we see some study that shows us the brands of cars most wanted in Google. In this 2018 has been the British insurer Veygo which has analyzed the behavior of the most popular search engine of all. They have used a tool called Ahrefs to check the searches obtained by the 42 leading car manufacturers in 171 countries worldwide. And repeating first position, as it happened in previous years, we have Toyota. The Japanese brand is the most sought after in 57 countries and add about 7.8 million searches per month. If we talk about presence we also have to highlight BMW and Mercedes, being the most sought after in 25 and 23 countries respectively, although if we go to the monthly figures, Honda and Ford would be above with 7 and 6.4 million searches respectively. In Europe we see how there is quite a disparity in the most sought after brands in Google. In Spain the popularity of Volkswagen is clear, while there are others who opt for some of their local brands. This is case of Mercedes in Germany, Renault in France or Volvo in Sweden. It also happens internationally with Maruti Suzuki in India or Perodua in Malaysia. It is striking that it has not happened with Skoda in the Czech Republic or with Fiat in Italy despite the sales levels. And is that the behavior of the market has little to do with Google searches? The proof is that Lamborghini is the most sought after brand in 12 countries, highlighting some like Venezuela, Dominican Republic or Pakistan. 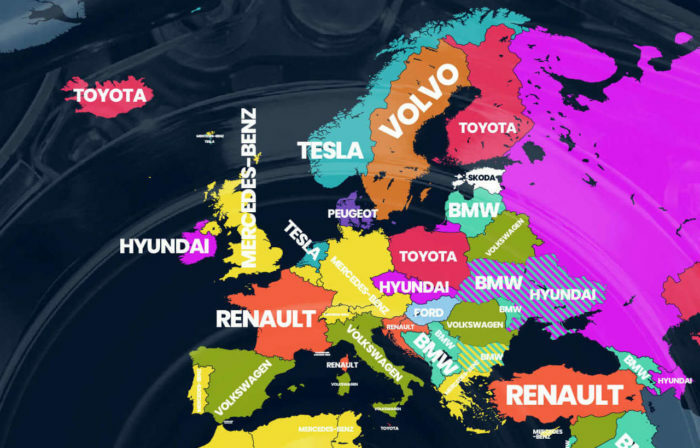 If we go to other curious cases we have Tesla as the most sought brand in 7 countries, among which are Norway (how not), the Netherlands or China. Highlights the presence of Toyota in North America, Australia and part of Africa; places where it is necessary to travel long distances and roads in poor condition abound. Hyundai is increasingly popular and attracts attention as it is the most sought after in Russia. It is also surprising that in Japan the most sought after is BMW despite its automotive culture and the presence of national brands. Brands and countries where is most wanted: Toyota (57 countries), BMW (25 countries), Mercedes (23 countries), Hyundai (16 countries), Lamborghini 12 countries. Brand monthly searches: Toyota (7,829,500), Honda (7.052.050), Ford (6.420.410), Hyundai (6,361,160), BMW (6.269.280), Volkswagen (5,795,680), Mercedes-Benz (5,078,799), Nissan (4.927.790), Audi (4.827.280), Renault (4.816.400).